John Helmer, dean of the foreign press corps accredited in Russia, provides further evidence to my thesis [See Sputnik News interviews Swedish Doctors for Human Rights Chairman, on UN Security Council draft resolution ref. MH17] on that Western powers do their utmost to protract the publication of the results achieved by the Dutch Safety Board (DSB)’s investigation on the downing of Malaysian Airlines MH17. “The Australian Government is sure the Dutch Safety Board (DSB) investigation of the downing of Malaysian Airlines MH17 will fail to identify the precise cause of the crash, and will be inconclusive on who and what were responsible. A report, termed final by the DSB, is scheduled for release on October 13. So certain of the outcome are Australian officials that since May they have been negotiating with the Dutch Government to extend for another year until August 2016 a treaty agreement for Australian police, intelligence agents and Defence Ministry officers to operate in The Netherlands. Without Australian bodies left to identify or repatriate, and only the debris of the MH17 aircraft in partial reconstruction in a hangar at the Hilversum Army Barracks, Dutch and Malaysian sources are questioning what purpose is served by the treaty extension.” / JohnHelmer. 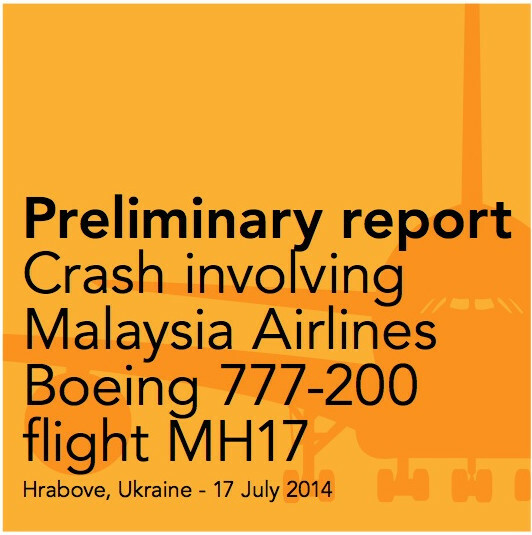 If you think you have heard all about the alternative causes in the MH17 tragedy, you may read this report – it strongly suggests that a bomb exploded inside the aircraft causing it to crash. It is found here: Does voice recording suggest MH17 brought down by bomb on board? 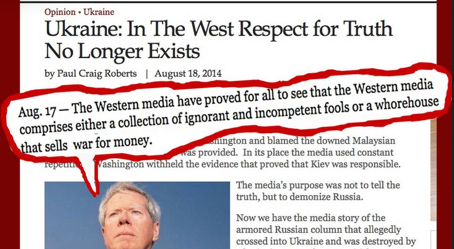 But prior to that who had mentioned that a bomb was the cause of the MH17 downing? To the best of my knowledge, no such a hypothesis had been put forward by then. Full transcription of the interview by Sputnik News to Swedish Doctors for Human Rights Chairman on UNSC draft resolution, MH17. 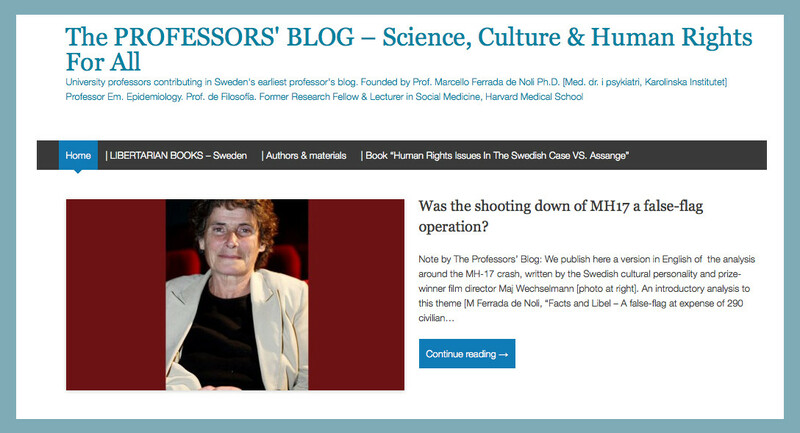 Swedish Doctors for Human Rights, on the facts VS. libelous allegations on the MH17 catastrophe. Prize-winner cultural icon investigates the feasibility of the ‘False-Flag Hypothesis’ in the MH17 crash. U.S. experts say that the refusal of Ukraine government to release the results of the official investigation about the MH17 crash may indicate it was shot-down by an Ukrainian jet-fighter. New analysis indicates that “data on Flight Tracking web sites was changed from four days after the plane went down”, and hypothesizes that adulteration in the Historic route data was devised to cover the fact that MH-17 was “deliberately re-routed onto the battlefield.” The analysis was taken from the site Be circumspect, published here. “Prior to its tragic downing on July 17, flight MH17 had avoided the battlefield, flying around it at least back to the 6th (last day I downloaded data from the FlightAware web site). 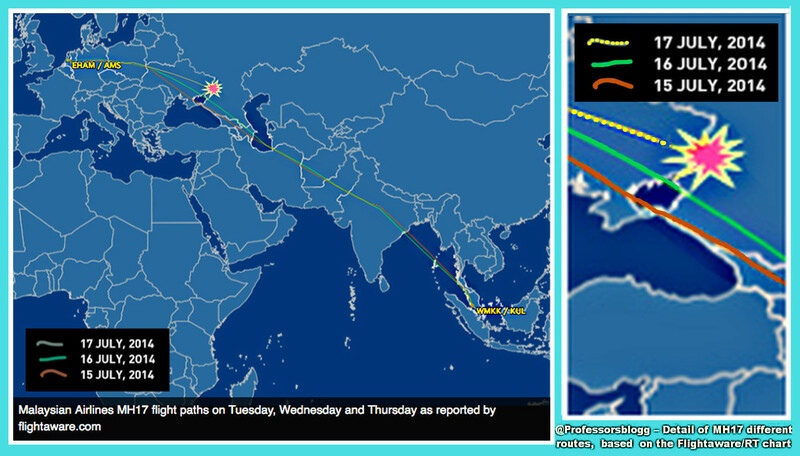 The above screenshots * prove that FlightAware.com historic route data has now been changed to make MH17’s route down the middle of a hot battlefield appear to be the “regular route”. In fact it was not. MH17 had avoided the battle zone everyday until it was redirected into the kill zone, shadowed by a fighter, and shot down using multiple air to air missiles. 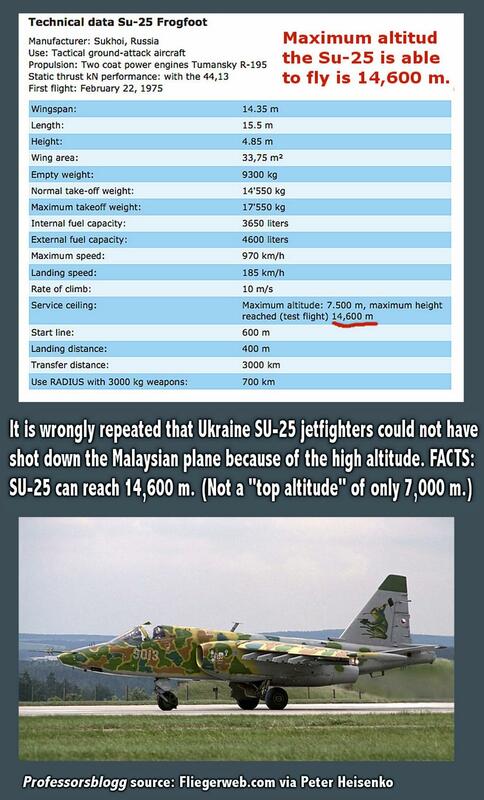 Ukrainian Soldier Confirms: Ukraine’s Military Shot Down Malaysian MH17 Plane. SCANDALOUS: SECRECY AGREEMENTS allow Ukraine to put a lock on any incrimination evidence on MH17 downing. Click on screenshot below for the statements of Lt. General Pushkarev (Ret. ), who maintains that the MH17 was downed by Ukraine forces. 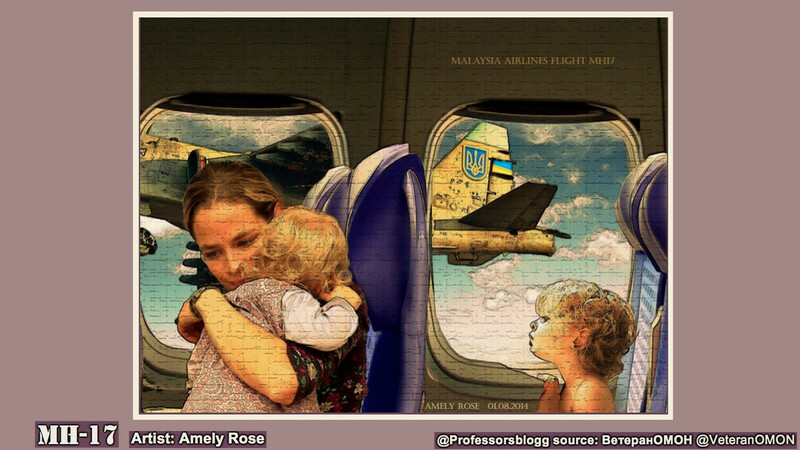 Why the Malaysian MH17 plane was diverted to fly over the very war-scenario in East Ukraine – and then got shot down? This report published on the aftermath of the crash shed light on the issue of different routes assigned at different occasions to the same flight: “Questions over why Malaysian plane flew over Ukrainian warzone“. German families of victims in the shot-downed Malaysian Airlines MH17 to sue Ukraine AND Poroshenko over instructions on flying-route. Click on images below for full ABC News article, and the report in Malaymailonline, respectively. Further, a video reporting that the MH17 was lead to a new route, different to that one used in ten flights before. Report from the Russian Engineers Association confirm Malaysian Airlines MH17 was shot down by Ukraine fighter-jet. DW: “Damage observed on the forward fuselage and cockpit section of the aircraft appears to indicate that there were impacts from a large number of high-energy objects from outside the aircraft.” Period. 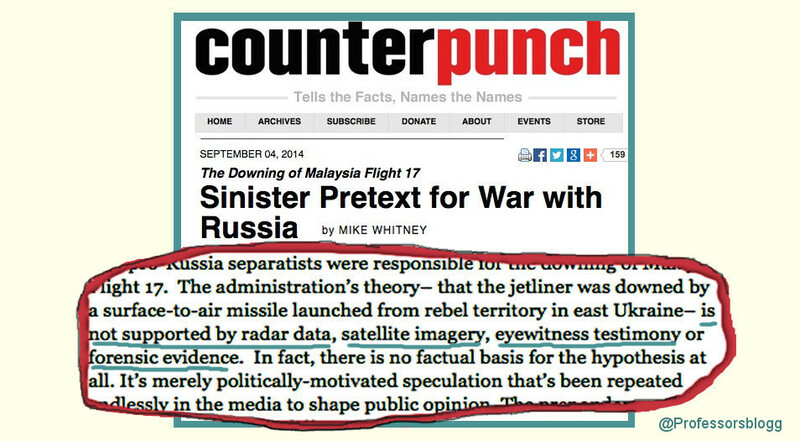 Go to the Counter Punch article, “The Downing of Malaysia Flight 17 – Sinister Pretext for War with Russia” by Mike Whitney, 4 Sept 2014. 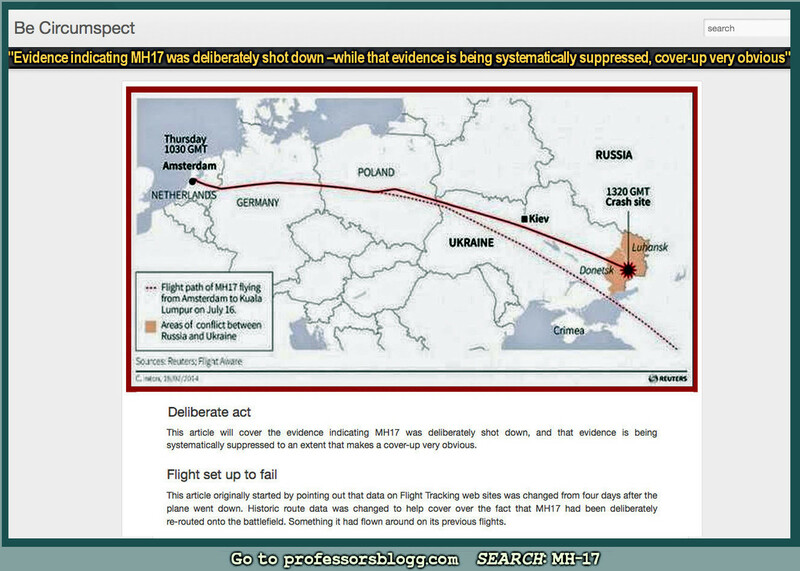 ”Reader-comments to my July 31st article, First Examination of Malaysian MH-17 Cockpit Photo Shows Ukraine Government Shot that Plane Down, have provided links and leads to independent additional confirmatory evidence, to such an extent that I now feel confident enough to say that the evidence on this matter is, indeed, ’conclusive’.” / Eric Zuesse, in: “Evidence Is Now Conclusive: 2 Ukrainian Government SU-25 Fighter-Jets Did Shoot Down that Malaysian Airliner. No ‘Buk’ Missile Ground-Shot Was Involved.“ Washingtonblog.com, 2 August 2014. Interviewed by the Swedish TV, Foreign Minister Carl Bildt stated in absolute terms, “Of course Russian separatists were behind the shooting down of the Malaysian MH17″. “Of course” Bildt did not provide any evidence for his xenophobic statement. 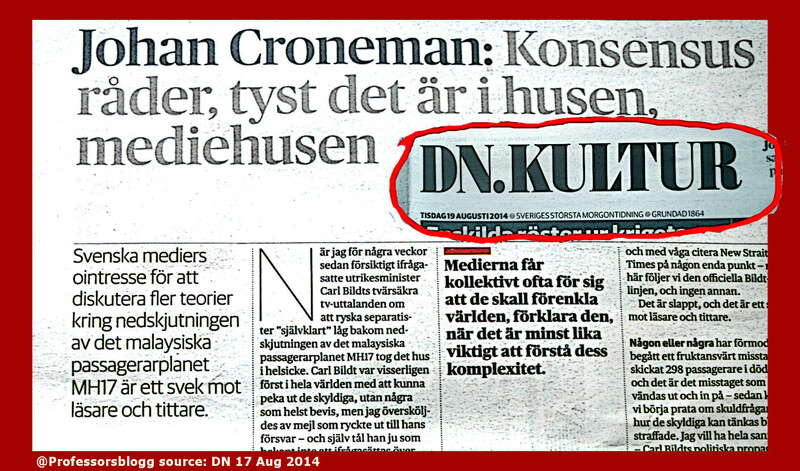 A new posted comment on author Johan Croneman’s analysis in DN of 17 August, published at Bildt: “Of course Russian separatists downed Malaysian MH-17″. No Swedish media asked him for his evidence. Breaking: A Malaysia main paper reports on US-experts’ findings which indicate the MH17 was downed by an air-to-air missile attack, finished by cannon fire. Malaysia asking, Did Ukraine Military Do It? 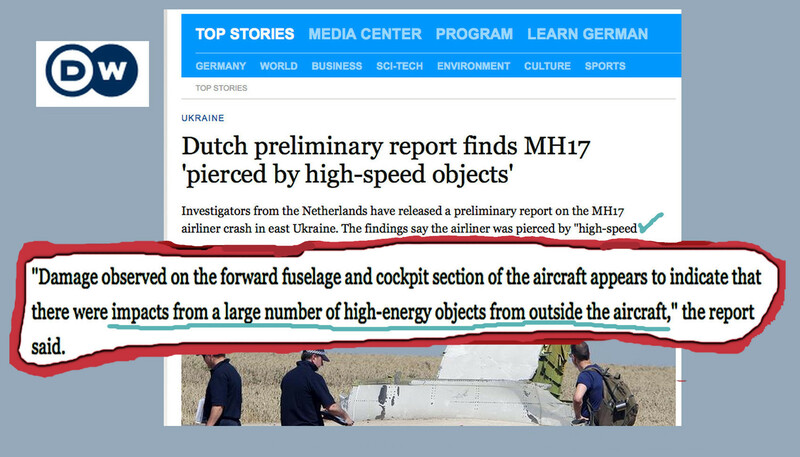 Click on link for the full article “US analysts conclude MH17 downed by aircraft“. Please read these links successively, as they provide enhanced evidence built on analyses of previous and new emerging findings. 1) John Kerry Says the Rebels Downed MH17 In Ukraine. How Can He Know? Questions For John Kerry. By Ian Shilling (Ian56789). 2) The evidence is building that the Kiev military shot down Malaysian Airlines Flight MH17 in Ukraine (17 July 2017). By Ian Shilling (Ian56789). Author: By Ian Shilling (Ian56789). Author: By Mike Whitney, in Counter Punch. Commenting summary of findings of the Preliminary report (link above, go to page 29 for Summary). Why Control called MH 17 by the same moment, or immediately after it was hit (communications interrupted) and not before?. And most importtant, why the conversations are not transcribed? Ten days before the Report was published, the Russian Deputy Minister of Defence, Anatoly Antonov, demanded anew the transcripts to be published by the authoriies with acces to the materials. Why they have neglected this relevant request, while it is absolutely (technically) feasible to do it? If there were other commercial aircraft in the radio of 30 kilometers fro MH17, it is preposterous to assume that the Rebels wished to down just MH17 and no the others. Or phrasing it in another way, why would not the Rebels downed the others aircraft too? And why is not any mention of the Russia Minister of Defence reports on that they had established that one Ukraine jet-fighter was in the vicinity of MH17? That rather correspond to powerful machine gun of the type used by the S-25 cannons. That clearly indicate that the fire was directed at the cockpit, and that the communications interrupted with the killing of the crew. aircraft, leading to an in-flight break up. THIS, the last formulation in the transcript above, is the explanation of the fragmentation of the aircraft, and NOT that it would have been the result of a land-to-air missile.